Those of you that have been around these parts for any length of time would have heard me say that we don’t do spring hockey. There’s a variety of reasons for it, but it all comes down to this: Balance. We run at full speed from the minute evaluations start in September until the end of whatever playoff run we get. Full. Speed. And that gets exhausting. For everyone. Then we have a brief period to catch our breath during the last three months of school and we head for the cottage. We rest, I read and everyone shifts gears and goes into summer mode. It’s a beautiful thing and it allows us all to recharge. For the last three years, my answer to the question of “are you signed up for spring hockey” has always been the same. We don’t do spring hockey. In yet another reminder that nothing in parenting is absolute, I introduce you to Boy #3. This kid has been in and around hockey rinks since he was two. One of his first full sentences was “I go hockey?” And boy, he was some kinda mad when we told him he wasn’t old enough. He was basically vibrating with joy as we dressed him for his first hockey practice. And there has been no turning back. For the past two years, he has hit the ice with a smile on his face and a stick in his hand. I’ve told you about Initiation hockey and how there are no games. There are scrimmages here and there if the coaches so desire. For my older two, this was just fine. They were happy to skate. This doesn’t apply to Boy #3. He wants to score goals. He wants to chase the puck. So when a friend mentioned Spring 3 on 3, I took a look at it. And it’s only games. No coaching. The kids play games on half an ice surface. Suddenly my “no spring hockey” policy disappeared in a puff of smoke. 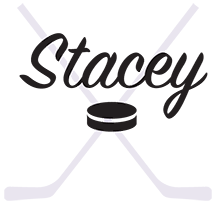 While I had many (many) good reasons for not putting the boys into spring hockey, there are several good reasons for me to have changed my mind. There is a shift in how hockey is being played at the Novice level. While I thoroughly straddle the line between for and against this policy, no one asked me. And that’s fine. We’ll play hockey the way our association dictates. Spring hockey introduces this concept of cross-ice hockey a little earlier. And Boy #3 is ready for that. This puts Boy #3 outside of his house league, against players that he might not encounter during the course of his normal season. Much like tournaments, putting yourself up against players with different styles requires you to learn the different style. This makes for a more well rounded player. Never a bad thing. And again, Boy #3 is looking for that challenge. There is no coaching in 3on3. This forces the player to think for themselves and to come up with solutions. At this stage in hockey, thinking creatively should be encouraged. I’ve started to read and hear a lot of professionals bemoan the lack of creative play in professional hockey players. That’s not to say that I’m banking on a professional hockey career for any of my boys, but why not encourage creativity where I can? Now there are some that will say this is just justification for why I prolonged our hockey season. And some that might accuse me of enjoying this more than my kids do. Then again, if it makes my kids happy in the process of becoming a more well rounded player, is it really so wrong of me to enjoy watching the process? We never did spring hockey either for the same reasons (plus they go from full speed winter sports to full speed baseball). Then, we left a team we’ve been with for 3 years and went to a new team. The new team was composed of a combination of several new boys from different teams, and most of them didn’t know each other. When the coach suggested some spring tournaments, no pressure, just get some on-ice bonding done, we all said yes. We ended up doing 3, which was one too many. Then, we had a full break during the summer. We didn’t even do a lot of practices before the preseason tournaments.